I have 5 of the 10 masters done of the Panzer Lehr. I hope to have this first pack available this weekend. I will work on the other 5 greens and hopefully have them out in a few weeks. © 2013, JLB Studios LLC. All rights reserved. Victory Force Choose Hand Feature "CHF"
This entry was posted in Miniatures News. Bookmark the permalink. Lovely… Even better than I had hoped! I am a little out of practice doing WWII figures. Well in that case I hope there will be plenty more chances to get back into practice! 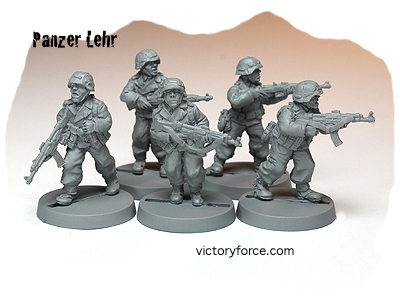 Very nice sculpts of Panzer Lehr. One of my favorite units. Will you be making MG-42 LMG teams and a Panzerschreck team for these? A pack of 4 kar-98k rifles, a pack of 4 MP-40s, and a pack of 2 MG-42 LMG teams (assistants with kar-98ks) would make the perfect Panzer Lehr squads. Panzer Lehr were never equipped with Stg-44s that I am aware of. Though it’s possible other units that wore the panzer wrap tunic had some. Nice work on the tunics, trousers, and helmet covers. I would definately second the need for some minis with LMG, HMG, Panzerschreck and Panzerfaust. Would round this set off nicely! This tunic they have on always seems theatric to me, Perfect wardrobe for a movie. SO I would bet I will be making more and with these weapons. They look great! Made instantly to my wishlist! Second the MG42 and MP40 teams as well! As far as “official” weaponry goes – on the very last days the Germans used whatever they could lay their hands on. Stg44, PPSH, even some British and American weapon popped up here and there according to the warstories. They had not much choice.. Very true. There were a few other units that wore the panzer wrap and they possibly had Stgs (Feldhernhalle IIRC was one). Just never found info on Pz Lehr having them. The fact that they were given preference for snazzy new toys isn’t what would have determined it, but what KtSn table they would be outfitted under. Either way, like you said, people like Stgs and there are people that will use them. Good news on the rifle and MP-40s. Good luck on the project. I will definitely be following its development.